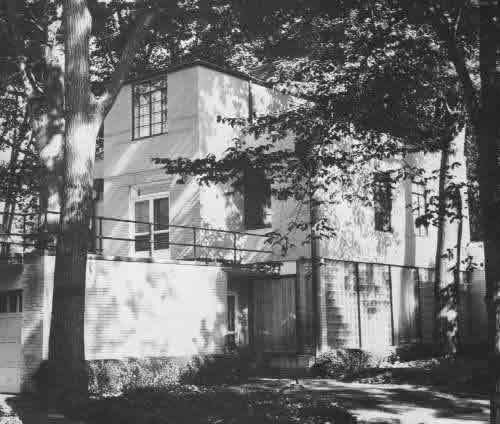 Harold Burdick not only designed and built this house for his own family, but also as an example of an International Style, mass-produced home. By using modern architectural concepts and manufactured materials, he hoped to create a prototype for a mass-produced house for middle income living. The later years of the Depression in the United States saw a blossoming of the International Style – the style of Gropius and his group at the Bauhaus in Germany, and of Corbusier in France. Built in 1938 for an estimated cost of $12,000, the Burdick House is a very rare example of a Midwest residence designed according to the principles of this short lived but interesting architectural mode. The International style shows itself in the use of glass block walls and ceiling-to-floor plate glass windows, thus proclaiming its steel frame construction. No masonry or wood construction could do this. The second floor deck over the garage with its slim curved railing is suggestive of an ocean liner, as well as the esthetic Corbusier set up in his 1923 Vers Un Architecture. Burdick used modern manufactured materials for his construction in an effort to link home construction with mass production, thus reducing costs. There is no hardwood in the house. Stucco and flooring are laid on Masonite board and the ceilings are Celotex. All interior walls are paneled to avoid having to maintain plaster. The entire frame is supported on steel beams and the interior walls are movable. In this American version of a “machine for living,” cabinets are built in and all doors slide into the walls on ball bearing tracks. The rooms wrap around a vertical core that contains the stairs, chimney and utilities. Yet there is ample space where it is needed, and a feeling of spaciousness for the activities of the family.